Zoe is full of life - bright and happy - very smart, and very very inquisitive! She thinks a lot and she always wants to know the answers. Zoe lives in Jerusalem, and hears about a man named Jesus. One day she's playing on the roof of her house, when she catches a glimpse of Jesus for herself. Among the people of the neighbourhood, there is a lot of talk about Jesus and what he has done. As the events of the Easter story unfold around her, will Zoe dare to know more and make her own decisions about Jesus or go along with what she is told? 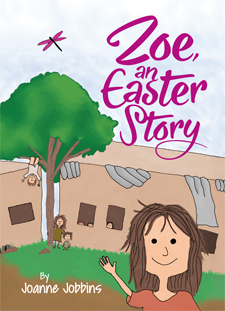 Zoe, An Easter Story, with its whimsical full-colour illustrations, is a book to read with your children - to ask them what they think, and help them understand that in their everyday lives they have the ability to have big thoughts and make up their minds about all kinds of important things.